The Aleut Community in Alaska holds culture camps every year to teach school age kids about their heritage. Various instructors teach different skills like the Unangan language, crafts, dances, cooking and so on. A few years back I was privileged to attend one of those camps in Cold Bay, Alaska to help with the building of some baidarkas. The picture above shows Candace, a resident of Cold Bay with one of the baidarkas that the students built. 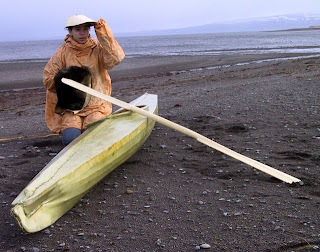 She is also holding a fur seal skin and as the wind was blowing hard, she is hanging on to her hat, another item made in the camp. This year, I am going back to Alaska to attend another culture camp, this one sponsored by the APIAI, Aleutian Pribilof Islands Association in Anchorage. Pictures to follow. To see what last year's culture camp was like, read the newsletter of the APIAI.